At seven o’clock each morning I wake up to my electric alarm clock. I turn on the radio, and then go into the kitchen to make coffee, pop some bread in the toaster and heat up some milk in the microwave. When I’m ready to head out, I put on my watch and check to make sure my cell phone and earphones are in my purse. This is what my typical morning looks like and, increasingly, what a typical morning of anyone in the modern age looks like as well. Our lives are inundated with electronics and appliances that either plug into the wall or use batteries. Our homes, cars, and workplaces are equipped with a multitude of gadgets and devices that provide comfort and functionality to all dimensions of our lives, and we have become dependent on them. 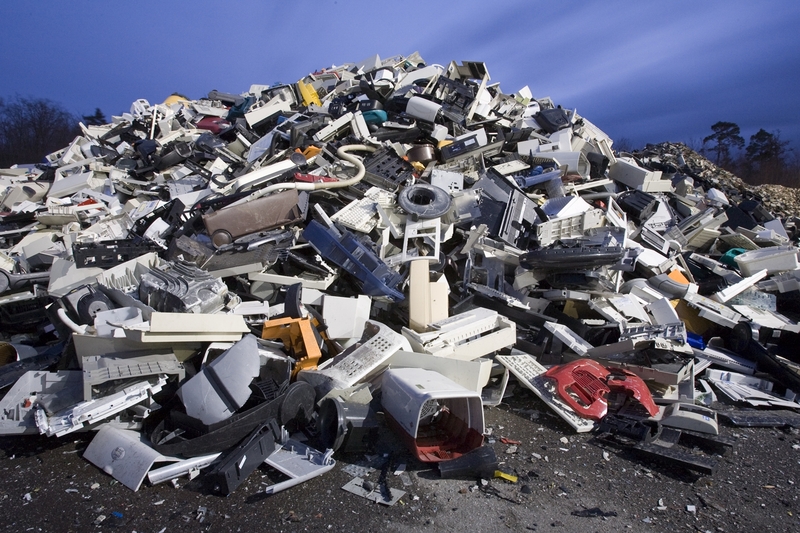 E-waste is growing at an alarming rate worldwide, faster than it can be recycled. The e-recycling industry is fairly new and faces many challenges to keeping up with the different types of electronics, brands, and influx of items that are recyclable, and maintaining standards that keep workers healthy and the environment clean is an ongoing challenge worldwide. The process for recycling electronics involves dismantling them into valuable materials that can be resold, and the process can be a source of toxic chemical pollution that harms workers, communities, and the environment near the facilities. The process can also release metals such as cadmium, lead, mercury, and nickel, and organic compounds such as flame retardants, and polychlorinated biphenyls into the environment. The amount of harm done depends on whether a formal or informal e-recycling business is performing the work. Developing countries tend to recycle e-waste at informal e-waste sites inside homes and in back yards, and the conditions are dire. The health of workers—including child laborers—and people in nearby communities can be adversely impacted by the multitude of toxic chemicals present. It’s common to find respiratory problems, babies with birth defects, among other health problems in or around these informal sites. Developed countries generally use formal e-recycling facilities, which tend to be larger and have better controls for health and environmental protection. These facilities usually refurbish, resell, or dismantle and shred electronics into separate recyclable materials, such as plastic and metal. In the last few years, developing countries like Colombia and China have established formal e-recycling facilities, moving e-waste indoors with varying degrees of protection from hazardous materials. Therefore, I worked with my colleague Zhao Dong, both of us researchers with the Hoffman Program on Chemicals and Health at the Harvard T.H. Chan School of Public Health, to question if transforming informal e-recycling businesses into better-controlled e-recycling facilities would solve the environmental and occupational health problems typical of the informal recycling sites. To learn about the current conditions of formal e-recycling facilities worldwide in terms of the health of their workers and their environment, we reviewed the literature and published our findings in the Environmental International journal, in a short review article “The Formal Electronic Recycling Industry: Challenges and Opportunities in Occupational and Environmental Health Research”. We found that the formal e-recycling industry is still very new, as is the research on the topic. The earliest publications dated back to 1999, and 21 (81%) of the publications reviewed were published after 2013. The past two decades covers the informal sector quite well, but there is a dearth of papers documenting conditions in the formal sector— we found 37 in total, including government reports. Despite limited studies on the topic, our findings are interesting and concerning. Our review suggests that worker exposures to metals were often higher than recommended occupational guidelines. Levels of brominated flame-retardants in workers’ inhaled air and biological samples were higher than those from reference groups. Air, dust, and soil concentrations of metals, brominated flame-retardants, dioxins, furans, polycyclic-aromatic hydrocarbons, or polychlorinated biphenyls found inside or near the facilities were generally higher than reference locations, suggesting transport into the environment. Lastly and most concerning, children of a recycler had blood lead levels higher than public health recommended guidelines because of the dust brought from work to home. This tells us that there are still issues to be addressed in the formal e-recycling industry despite the improved environmental and occupational health conditions compared to those in the informal sector. In our review, we discuss challenges and opportunities in occupational and environmental health research in this area and identify research needs to further assess exposures, health, and improve controls. We recommend that the long-term solution is to manufacture electronics without harmful substances while designing them with easy-to-disassemble components. How Can We Solve the E-waste Problem? The e-waste problem is an international issue and is very complex. Strengthening the formal e-recycling industry will help to improve the health of workers and the community of e-recyclers worldwide, and when done appropriately, provides one of the solutions to the problem. What’s more, each of us consumers can also contribute and become part of the solution. Do not throw away electronics or electrical equipment including batteries, light bulbs, and solar panels into the regular garbage. Many work places collect these items separately. For homes, residents can explore the many well-established e-waste collections, take back programs, or processing facilities. These services are usually free, although it depends on your state and the item to be recycled. To find the best collection programs or the closest e-waste processing facility near you, you may check government websites or your local health department. Alternatively, look for the nearest processing facility by visiting the electronic recycling industry certification websites—some examples are: http://e-stewards.org/find-a-recycler/, https://sustainableelectronics.org/recyclers. Support electronic recyclers in your community. You can usually dispose of your e-waste by visiting these facilities or go to free community collection days. Do not buy electronics or electrical appliances that you do not need. Upgrade your phones and electronics less frequently. Support electronic and electrical equipment manufacturers that use green technologies and have take back programs. Thank you for addressing this very important topic! I don’t think this issue gets enough attention! Savvy article , I was enlightened by the specifics – Does someone know where my assistant would be able to acquire a sample CA CDPH 72R example to fill out ?